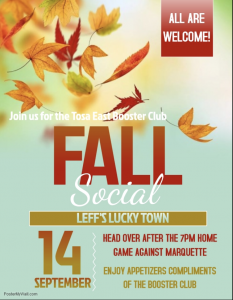 Come and join the booster club members for a fall social at Leff’s Luckytown after the football game on Friday, Sept. 14. You don’t need to be a member to go, but you can become one before you leave! The booster club helps to financially support the Tosa East athletic programs, helping to purchase a variety of items. Some items include, warm ups, shooting machine, Hudl software for film review, practice jerseys and many more things!